A straightforward or routine infrastructure project doesn’t exist – there are always unique characteristics and challenges. Which is why getting design teams, engineers and specialists together at the planning and feasibility stage always pays dividends. Consider this scenario. A new road bridge is needed over the West Coast Mainline. It has to be within metres of a new housing development. The piles needed for the bridge foundations must be sunk 25m deep into chalky ground. The foundation piles also have to be installed during the day while the rail line is operational, without any risks from rig stability or cage handling. This was a real challenge our team faced. 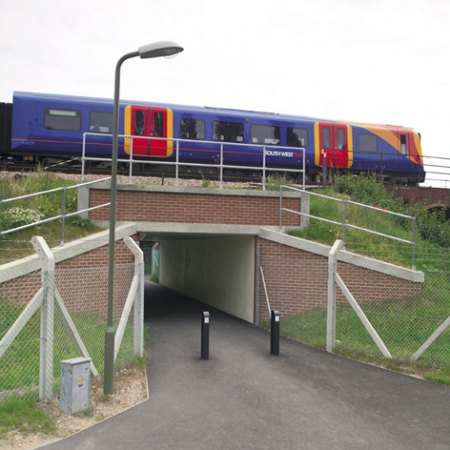 Any solution also had to meet Network Rail’s Outside Parties Asset Protection Guidelines together with the requirements of the local highway adopting authority. After getting the right team together early on, Osborne developed and proved an innovative method that allowed the bridge foundations to be completed during normal daytime operation of the line. The final bridge structure was installed during a very short 5 hour overnight rail possession. What would you do if you needed to remove 1000 tonnes of clay to create lift shafts in London’s 6th busiest station (Euston), in a programme that entailed extensive demolition and propping? Network Rail procured a design and construct solution that facilitated early engagement and collaboration to tackle this task. Through value engineering, Osborne changed the pile design to a tanking system. This reduced cost as the number of temporary piles came down from 58 to just 28. The station remained fully operational during the works. You can see more details of the solution here. These are just two examples of where Osborne has engaged early with a rail infrastructure project to deliver cost savings and better outcomes. Some of the techniques may be applicable to other projects, but the part that has the greatest enduring value is the approach. Early collaboration from a range of specialists is always the best way to innovate and find solutions that save money, improve quality and minimise disruption to our rail network.